Three years after nationalisation in 1951, the first of a new range of standard steam locomotives took to the rails, only 6 years after the end of the Second World War, and in the same year as the ‘Festival of Britain’. The post-war years were marked by shortages – not just of food and everyday items – but also by shortages of labour and the raw materials for industry. Britain was still operating a rail system dependent on steam and coal, but was also casting an eye to the adoption of oil, and new power systems to rebuild its railway network, and its locomotive stock. Many of the steam types still in use were well past pension age, and had been designed for specific routes and operating requirements of their previous owners. Standardisation of components, and other aspects of design and construction had been pursued most strongly by he GWR and LMS, whilst others such as the LNER and Southern Railway had pursued a more varied path. The Southern in particular was probably the most radical and innovative of the ‘Big Four’ in the years leading up to nationalisation. The list above shows that the subject of this little overview was not even provided with a number range, or quantity at this stage. It was to be introduced in 1952, with Doncaster as the parent office for its design, and building of the eventual 115 locomotives would take place there, and at Horwich Works. There were 11 batches – constructed between December 1952 and October 1957 – but although Doncaster was awarded orders E395 (76020-4) in 1952, E396 (76025-34), part of this last order (76030-34) was built at Derby. In 1954, Doncaster was given order E397 (76035-44), but these too were transferred to Derby. Horwich had the honour of building the first of the class – 76000 in December 1952, and the last to be built, 76099, was also outshopped in November 1957, despite Doncaster turning out the last numbered member (76114) the previous month. However, it still begs the question why the class were ever needed, given that its design was very much based on Ivatt’s last 2-6-0 design for the LMS, since no fewer than 82 of that design were built by Doncaster and Darlington between 1948 and 1952. At least it made sense to give Doncaster the prestige of being the parent office for the design of this BR version. Click on the image below to follow the story in a little more depth. Did BR Workshop Closures Benefit Manufacturers? Back in the 1960s, as the British Railways Workshops were being re-organised under a programme announced in 1962, the UK still had a significant number of private sector manufacturers. Although, some were already in serious financial difficulties, as they tried to make the transition from building from steam to diesel and electric traction. In 1965, the British Railways workshops in North Road, Darlington, some 1,400 employees were building diesel locomotives. So, they had made the transition, and as part of BR were supporting the modernisation programme. Darlington – the birthplace of railways – the locomotive works closed in the same year that England won their one and only football world cup, resulting in the loss of more than 2,100 jobs. From the autumn of 1962, when news of Darlington’s closure was announced, thousands of protestors filled the A1 (the Great North Road) in the centre of the town, and the traffic struggled to pass. These protests continued – and were widely reported in the local press – continued until the works was closed in 1966. I did address a Question to the Minister on 22nd March asking him what reduction had taken place in the manpower of the railway workshops over the last five years. I was informed by the Minister that 24,000 jobs had disappeared in British railway workshops over the last five years. So it seems to us that over the five years of Tory rule preference has been given to private enterprise, and publicly-owned industry has been deliberately sabotaged for doctrinaire reasons and, as a consequence, the labour force has been allowed to run down too rapidly. As far as I am aware, A.E.I. has not got any locomotive building works. Much of this work is put out to subcontractors. The jigs, the tools, the templates, and the fixtures in Darlington North Road shops were transferred to a private firm—Beyer-Peacock in Manchester—so that it could fulfil a subcontract for part of the order for diesel locomotives. This action was taken by the Railways Board in spite of the assurance given by Sir Steuart Mitchell at that time to the Railway Shopmen’s National Council that everything possible would be done in the granting of new orders to alleviate the necessity for redundancy at Darlington. Machinery and equipment were disposed of to private enterprise. At the same time, the manpower in the workshops has been allowed to run down. It (British Railways)has completely over-estimated the number of redundancies that should take place. This is borne out by the fact that many railway workshops now work a considerable amount of overtime. This includes some shops in Darlington. As much as 30 hours a week are now being worked in overtime in many workshops.Many of the thousands made redundant struggled to find work, but the nearby Darlington & Simpson Rolling Mills provided some opportunity for continued employment in engineering. It is equally ironic perhaps that in addition to the closure of BR’s Darlington Works, Beyer-Peacock’s Gorton Works were closed in the same year – 1966. Rather like the North British Loco Co. in Glasgow, which closed in 1962, Beyer’s foray into diesel traction was not successful, as they allied themselves to the Western Region’s use of diesel-hydraulic types. Perhaps the company’s most well known design was the ‘Hymek’ Type 3. That said they also fabricated the mechanical parts for diesel-electric and electric locomotives, but they found that subcontracting activity uneconomic. The ill-fated Clayton Type 1 was very definitely non-standard, and had technical shortcomings too. On top of that, Beyer Peacock also built what was perhaps the worst diesel locomotive ordered by British Railways – the infamous “Clayton Type 1”. BR had ordered no fewer than 117 of this twin engined, centre cab design, straight off the drawing board, and Beyer’s were unfortunate enough to be the sub-contractors for the last 29, built in the company’s final year of life, 1965. Looking at Beyer’s position in the 1960s, the possibility of the Darlington tools being transferred to Manchester increases. In 1962 Beyer’s were awarded 2 orders for 18 locomotives each, of the Type 2, (Class 25/3 in TOPS numbering) 1,250hp Bo-Bo design, to be numbered in the range from D7598 to D7677. The other 44 locomotives were to be built at Derby. NB: The heading illustration shows the preserved D7628 “Sybilla” – on the North Yorkshire Moors Railway in 2016. Photo (c) Charlie Jackson, and Licensed under the Creative Commons Attribution 2.0 Generic license. However, Beyer-Peacock were unable to complete the final 18 locomotives ordered by BR and the work was transferred to Derby. Given that the Type 2 locomotives were a BR design, and were predominantly built at Darlington – all of Class 25/0, and many from classes 25/1 and 25/2, it does seem likely that any jigs and tools could have been provided to Beyer-Peacock. The idea that the Government and British Railways Board allowed the transfer of jigs, tools and other machinery to Beyer-Peacock in the 1960s does not seem to have prevented the company from failing. So, with hindsight both the BR workshops – Darlington in particular, where many BR Type 2 diesels were built – and the Beyer-Peacock works in Manchester were significant losses to the engineering industry. On the one hand, the BR works closed as part of a Government plan to reduce railway workshop capacity, and on the other a failure of the particular private sector business to make the right commercial choices perhaps. Francis William Webb was appointed Locomotive Superintendent of the London & North Western Railway (LNWR), in 1871, and for 32 years held that position, until failing health forced him to resign in 1903. He has been described as an autocratic manager, and during his time, it has been argued that much of his work – especially in the use of compounding – was unnecessary or ineffective operationally. However, it cannot be denied that he was a man who drove the development of Crewe Works, and established the company at the forefront of railway and engineering technology in the Victoria era. His engineering knowledge and desire to provide innovative solutions may not always have been a success – either practically, operationally, or commercially – but they took the boundaries of the technology forward. Whilst he inherited the development of Crewe Works from his predecessor John Ramsbottom, it was Webb that pioneered the use of both Bessemer and Siemens Open Hearth processes to manufacture steel rails. 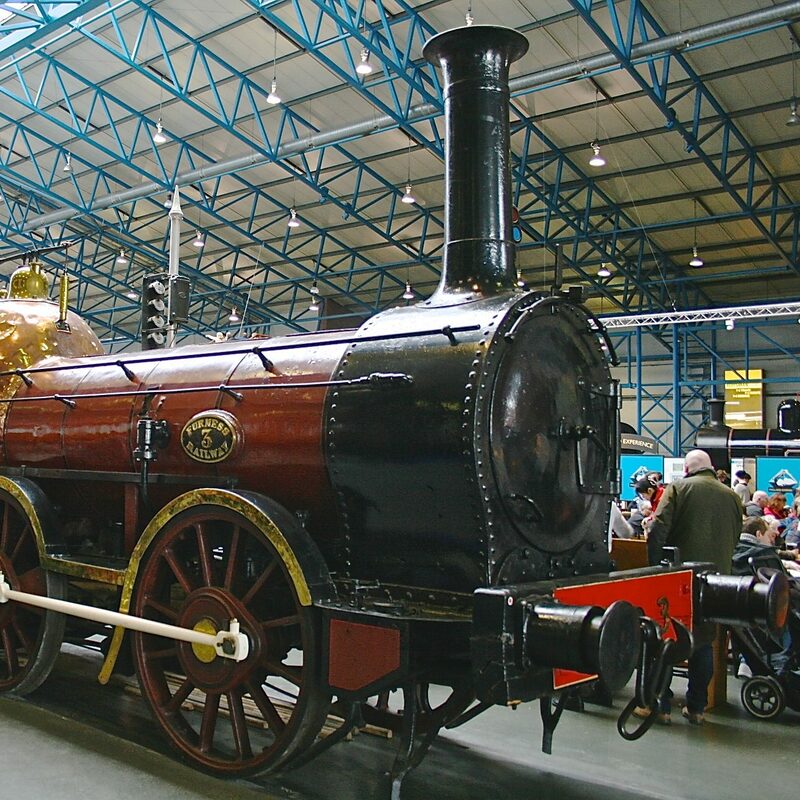 Webb started his career back in 1851, at the age of 15, as an engineering apprentice, under the tutillage of Francis Trevithick, and later John Ramsbottom – himself a prodigious inventor, designer and locomotive engineer. By 20, Webb had moved into the Drawing Office, and in March 1859, when he was just 23, FW Webb was appointed Chief Draughtsman. In 1862, the LNWR was formed by the combination of the Manchester & Birmingham, and Grand Junction Railways, and Webb was promoted and moved to Crewe as Works Manager, as John Ramsbottom was appointed CME of the LNWR. One of Webb’s 3 cylinder compound goods 0-8-0 locomotives at work. Worth noting is the obvious size of the central low-pressure cylinder. Photograph: Historical Model Railway Society Collection. Intriguingly, Webb left the railway company in 1866, to join the Bolton Iron Co. – confirming perhaps his expanding engineering interests and knowledge. The Bolton company was part owned by John Hick, who later became a director of the LNWR. Less than four years later, and due to John Ramsbottom’s deteriorating health, Webb returned to the railway in 1870, taking over completely in 1871. It may seem urprising that a Vicar’s son from Tixall could rise to such heights in such a short period, but it must be remembered that railway and locomotive engineering was the ‘new technology’ of the day, and certainly a new industry. Unliked his brother, Francis Webb showed little interest in a religious career, but showed both an aptitude and great ability in menchanical engineering. Whilst that ability may not have been enthusisastically lauded by the operational railway engineers on the LNWR, his successful locomotive designs were very successful, and a number lived on into the British Railways era. Of the 26 different locomotive types delivered under his leadership, only 11 were compounds, the remainder – some 2,563 locomotives, were simple expansion. The compounds totalled 531, with most built in the 1890s. I originally wrote this item for the magazine “Engineering in Miniature” back in the 1980s, and wanted to revisit the matter of compound operation in steam locomotives. The magazine is still in full swing, and I envy the skills of the model engineers, who are everywhere producing small – not always that miniature – replicas of the real thing. Their skills in almost every aspect of engineering practice, and their workshop capabilities are something we can all be proud of. In 1948, the Railway Executive made a recommendation to the British Transport Commission to adopt, in principle, the application of a system of automatic train control. The term “Automatic Train Control,” although that was its official title, is probably somewhat misleading, since it does convey the idea of total automation and that, as we know today, is something entirely different, The ATC system subsequently adopted on British Railways provided for a visual and audible warning of the position of a distant signal, and where the latter was at caution, if the indication in the locomotive cab was not cancelled by the driver, an automatic brake application was made. There were prior to 1948, two other ATC/AWS systems already in use, that on the GWR, introduced there in 1912, and a system, similar in many respects to the later BR standard type, installed by the LMSR on the LTS line in 1938. In keeping with the Railway Executive’s principle of standardising combinations of the best practices from other regions, experiments of various kinds were carried out between 1948 and 1952 on potential ATC/ AWS systems. On the face of it, only having two practical systems with which to effect comparisons, the task would seem to have been relatively straightforward. However it appears that a number of technical difficulties arose during this time, and then, if one is to believe the report of the inquiry into the disastrous Harrow & Wealdstone accident of October 1952, there was the question of snow and ice in the north. 1n point of fact it was the cause of this accident which both laid emphasis on the need for, and gave additional impetus to, the development of British Railways Standard ATC system. The prototype apparatus was installed during 1952 over the 43 miles between New Barnet and Huntingdon on the Eastern Region main line. The first locomotive to be equipped with the new ATC apparatus was the new Peppercorn Al Pacific no. 60150 Kestrel, which on 17 October 1952 took the 3.10 p.m. from Kings Cross on the first of a series of tests. The testing took some considerable time, for it was not until 1957 that the authorities were entirely happy with the system, and then declared it to be adopted for standard use on all regions of British Railways, the GWR system notwithwithstanding, although much of the latter was replaced by the BR standard system in later years. It has now been fitted to almost all traction units and extended to cover most of the important lines throughout the BR network; the title being altered to Automatic Warning System in order to give a more precise indication of the system’s function. Operation of the system was based on the use of magnets situated in the permanent way between the running rails, with the tops of the magnets at rail level. The designed purpose of the system was to give the driver audible and visual indication of the position of a distant signal, 200 yards in advance of the signal. The two magnets were placed 2ft 6ins. apart, centre to centre, the one furthest away from the signal being permanent, the nearer being electrically activated when the distant signal was held in the clear position, and dead when at caution. If the indicators were overrun with the signal at caution and the driver had not cancelled the indication, an application of the brake would be made since the apparatus was connected to the automatic brake. There were a total of four indications of the position of a distant signal that could be given to the driver, two visual and two audible. The audible indications were given by a bell or a horn; the former ringing for two seconds on passing over the inductor of a distant signal at clear, and the horn was actuated after a delay of one second on passing over the inductor of a distant signal at caution. The two visual indications were provided by the Driver’s Control Unit (DCU). On passing over the permanent magnet of a signal at caution, the visual display would be changed from yellow and black to all black; then on passing over the electromagnet the horn would be sounded and an automatic brake application made after a delay of three seconds. Re-setting the equipment by the driver would return the display to a yellow and black aspect. If the signal being approached was off, or at clear, the same procedure would take over the perm- anent magnet although, since the electromagnet would in this case be energised, on passing it the DCU display would remain black and a bell would ring for two seconds. In point of fact the DCU would display a black indication until a distant signal set at caution was approached, following which, operation of the re- setting device would change the display to yellow and black. From one shopping to the next, all items should function without maintenance from the shed staff. Should one item fail, it could be replaced without requiring any disturbance to the electrical wiring. The sensing device, or receiver, was mounted on a stretcher immediately in front of the leading coupled wheels and positioned centrally between the frames at a height above rail level of about 4 Y, and 6 Y, inches. The height of the receiver was not over critical, hence the allowable range of movement of two inches although once fixed no provision was made for adjustment. The receiver was basically a polarised relay, actuated by the track mounted inductors, to transmit electric current to the Relay & Cab Junction Box. This was effected through its own junction box mounted on the frame, to which it was attached through a flexible connection. Flexible connections were provided between the receiver junction box, receiver and relay unit, to allow for any relative movement between the engine frame and receiver. The relay and cab junction box, or relay unit, could be described as the nerve centre of the apparatus, to which all cables from the other items of equipment were connected, its function being to translate the electrical information into audible and visual indications of the signals and where appropriate to initiate the application of the brake. Perhaps the second most important item was the Driver’s Control Unit (DCU) on this unit, the signals being displayed to the driver visually. The unit, mounted in the cab on the driver’s side contained an electro-pneumatically operated solenoid valve, indicator and resetting handle. The solenoid valve, being connected to both electrical and pneumatic circuits and when not activated, under normal conditions ensured that the feed to the horn was maintained at normal air pressure with the brakes off, via the timing and ATC reservoirs. The last key item of equipment on the engine was the ATC Brake Valve, through which the actual automatic application of brake was made. The Brake Valve consisted of a diaphragm acting on a flat disc whose centre was attached to a spindle operating the main brake valve. The valve was normally closed to atmosphere, one side being attached to the train pipe and the other to the Timing Reservoir. Application of the brake was made by admitting air at a controlled rate through the Timing Reservoir, lifting the diaphragm and opening the valve to admit air to the train pipe. A plug on the valve, which would normally be sealed in the open position, could be screwed down to close it in the event of a failure. The remaining items of equipment could probably be classed as ancillary, except perhaps for the ATC Vacuum Reservoir, whose function was to maintain vacuum in the Timing Reservoir and to equalise pressure between train pipe and ATC side of the brake valve. On the whole, it is not necessary to describe all the individual items of the Standard AWS apparatus at this stage, since it is the broader principles of the operation of such devices that concerns the majority of us. In retrospect it is interesting to note that much of the equipment, including the specialised electrical devices, was perhaps crude and bulky when compared with equipment of today. As previously indicated, it was not until 1957 that British Railways decided to adopt as standard the form of AWS described here and eventually extended to cover most important lines on the system. It was intended to fit all traction units with the equipment. Though this has largely been accomplished, quite a number still remain in service unfitted. The GWR’s original electro- mechanical method of AWS has also now succumbed to the standard arrangement, removing the last traces of individuality of that region. Doubtless though it will not be long before the Standard AWS is superseded by a more sophisticated arrangement further to improve signalling and train control. BR London Midland Region Magazine – November 1952. BR Automatic Train Control: Maintenance Instructions [BR 31168/2). BTC Handbook For Steam Locomotive Enginemen. See also: Kempe’s Engineers’ Yearbook Vol. 1.
Who would have thought that 33 years ago, the national rail network was planning to provide strategic and phased withdrawal of older motive power, and replacing it with newer, more efficient (operationally and economically) over a 25-year strategy. The plan was to cover the needs from 1985 to 2009 – what happened? One factor may be that 6 years into the plan, the fragmentation and disintegration of rail services began to take place – “privatisation” – which contributed to the continued existence of poor quality passenger and freight services we have today. Who would have believed that those rail/bus combinations – the “Pacers” – would still be running. That said, there were successes – on both the passenger and freight motive power fronts, but with a 10-year gap between the last genuine BR type – the 100 Class 60 locomotives, and the imported General Motors Class 66. These latter were built between 1998 and 2003, and developed from the privately run Foster-Yeoman owned Class 59 diesels, introduced the year that the BR strategy was published. Of the diesels built since the publication of the programme, only 100 were built in the UK, and the remainder, some 547 locomotives, were supplied from the USA. By 1991, the East Coast Main Line was completed, with the latest IC225 motive power (Class 91) operating on a fully electrified main line, the Channel Tunnel was being built and BR’s Crewe Works had built the only other electrics to appear – Class 90. Further main-line electrification after completion of the East Coast route could increase the number of electrics by about 150, with a corresponding reduction in the total number of diesels. So, it may be clear from what happened in the late 1980s, and on into the 1990s, there was little or no expansion in locomotive power for main line services. The fixed formation high-speed train sets brought in with the HST/IC125s expanded after the turn of the century, with the all new tilting trains – the “Pendolino”. So the likelihood of high-speed passenger diesels or electrics was a non-starter, and the lack of a co-ordinated strategy nationally during the 1990s, left the private train operators with options to buy/build on a more or less ad-hoc basis. For freight service, equally, little or no long term planning was the likely outcome of a post privatisation service, and the ‘off the shelf’, or at most the modifications of the private builders’ designs was inevitable. As can be seen from the little table showing the current position of freight diesels, nothing was built in the UK, and almost all were North American in origin. A curious choice perhaps? What would the railway’s motive power have looked like if at least some of BR’s 1985 programme had been implemented? Would more knowledge and expertise have been retained in the UK rail industry, would they have been more or less successful, in performance, in efficiency and reliability? Who knows, but perhaps the most obvious missing element of the jigsaw is the lack of strategic planning in the 21st Century, with no planned withdrawals and replacements, just tactical remedies as the creaking infrastructure is upgraded in a piecemeal manner. Yes, passenger growth has been considerable, and perhaps that in itself should have led to the development of a longer term strategy. This was an 0-6-0 goods locomotive, built by the North British Locomotive Co at its Queens Park Works, in Glasgow in 1926. It was produced about ½ way though order L821, awarded to North British in 1926. Order L821 consisted of 25 of these locomotives, carrying works numbers 23456 – 23480, and became part of the LMS company’s standard fleet of 0-6-0 goods tender locomotives, when Henry Fowler was that company’s CME. No fewer than 80 of what became the LMS standard 4F goods engine were built by North British, along with numerous ‘Jinty’ tank engines, and of course, the famous ‘Royal Scot’ class locos. The LMS had a strong supplier/partner relationship with North British in the 1920s, and the orders helped to keep the company in business during the traumatic years of the 1920s and 1930s. The engines were built at Queens Park Works, because the North British Atlas Works had had to be closed, due the country’s dire economic recession. The railway company too was undergoing significant changes at its works, and in particular, at Crewe, where major re-organisation was under way. In fact, during the early ‘depression’ years of the 1920s, North British’s Queens Park Works built some 201 locomotives for the LMS, including 7 for the Northern Counties Committee and a batch of 25 0-6-0 pannier tanks for the GWR. This engine was put to work in 1927 for the LMS, carrying running number 4394, and by 1950 had already completed thousands of miles of service, on its intended work, with coal and mixed wagon loads of main line and branch traffics. After nationalisation, she was renumbered 44394, and was rostered at Mansfield shed (16D), then in one of the final allocations was transferred to Stockport Edgeley (9B) by 1964.